The DCA participates in the City's clean up days. Our focus is usually around the Dal Community Centre at Empress/Somerset, including the stair-streets over Nanny Goat Hill. A number of participants commented on how many pedestrians, dog-walkers, and passers-by thanked them for the tidy up efforts. (let me know if I missed any names and I'll add them...). 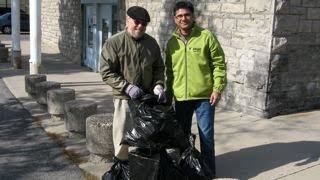 Shown below is Yasir Naqvi, MPP, and a resident with their booty. Volunteers sported fashionable work gloves supplied by the City.